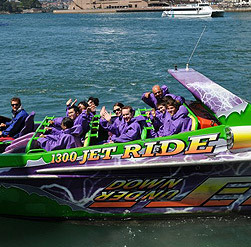 Want to entertain clients, reward a team or organise an unforgettable team building event then why not experience the Jet Boat Ride of a lifetime and see Sydney harbour in an alternative perspective! We can tailor to suit a group of any size. It is the perfect experience for staff outings, team buildings and corporate days. The rush of the wind whipping through your hair, your face splashed with salt spray and 270 degree spins makes this an adventure you cannot afford your team to miss out on! The National Australia Bank enjoyed a day out on our jet boat and this is what they had to say about their experience: “We were looking for a fun, positive and all inclusive team building activity to promote a sense of cohesion and comradery between two business banking centre. We found that Down Under Jet met all our requirements for a large number of people and offered more. 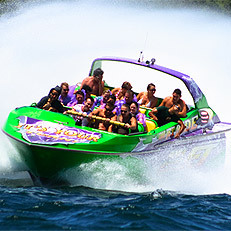 We experienced a fast, exciting and unforgettable ride that satisfied our entire group and achieved our desired goal. 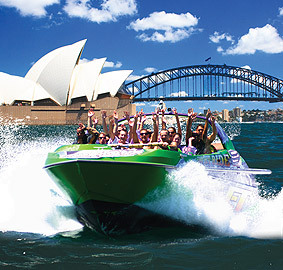 We would highly recommend the experience of the Down Under Jet boat ride to any corporate company.” (NAB) Hunter Valley Events enjoyed the DownUnder jet boat experience for their team outing and stated that: “Down Under Jetboats delivered a great corporate experience as part of our race activity around Sydney Harbour. Lyndal was a pleasure to work with accommodating all our requirements even last minute time changes with professionalism and enthusiasm. The team were fantastic with all our corporate teams during the jetboating experience. They were a pleasure to work with – thanks for a great day!” (Peree Watson, Event Coordinator) To receive your corporate quote today call us on 1300 538 743 or email us. Are you looking to put a different spin or maybe add a new twist to your group events? Contact us to discuss a specially designed and tailored package for you and your group event. All your requirements and a full event can be coordinated and catered for by our professional team. We can also cater our experience for children’s birthday parties. 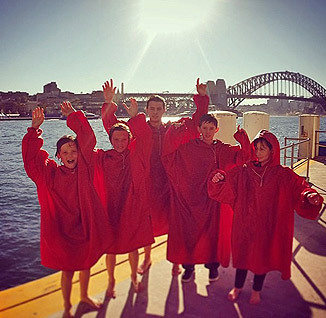 We operate from Circular Quay but can also drop off and pick up at lots of Sydney Harbour locations such as Luna Park, Watson’s Bay, Darling Harbour and Taronga Zoo. Contact us for a quote. To book your experience call us today on 1300 538 743 or email us.